As many of you know by now, we are working with ESL to deliver prize money to all players skilled enough to make it into the Eternal tier by the end of the season. The initial delivery process was forecast to take be approximately one and a half months after the close of the season. In general, we hope to reduce this timing over the coming seasons. However, due to the holiday/new year period that is upon us, this process has taken longer than we would like, which is why those of you who reached the Eternal tier during season 2.0 have not received your prizing yet. For this, we are sorry. We're working with ESL to get your prize money to you as soon as possible, and are looking to get that money to you early this week. Apologies once again for the extensive amount of time that this has taken. ESL has sent the prize money to all Eternal players from League Beta 2.0! If you provided Paypal details to ESL, you probably already have your prize. If you don't, you should receive your funds in no more than 24 hours. Those who chose to use bank accounts will have to be slightly more patient as the process of transferring funds internationally between banks typically takes 5 business days. We hope you had a blast during League Beta 2.0. Our thanks go out to those of you who continue to put the League system through its paces. P.S. 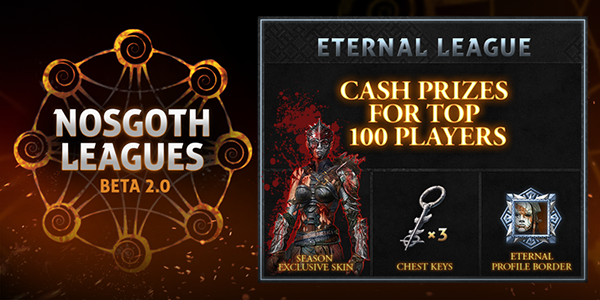 - League Beta 3.0 Eternal Players, you can expect to receive your cash prizes midway through January. Not a bad way to start off the new year . Last edited by Oghamsmith; 22nd Dec 2015 at 19:34. Hi. Today I got my money from the leagues beta 2.0, or atleast a part of it. That's why I write this: I was 26th when the league ended, but i only got 80 dollars instead of 100, why?! Hi.I also won 100$ finishing in 24th place in 2.0 league which is 92 euros and the money i got was 67$ which is around 62 euros.As i talked with some of my friends they got their prizes as they should so it's not a change in the prize.Why's that? I'm looking into this at the moment. Should have a response from peeps for you tomorrow. Hi there guys, this is just a quick update to let you know that I'm still awaiting a response to my inquiry. You have not been forgotten. After having checked with ESL, they have indeed sent $100 to each of you. It would be worth checking with your banks to determine whether or not they have applied any fees to the transaction, as this can sometimes be the case. It says, originally it has been 80 US dollars which were 72,78 € at this date (which was correct). And from these 72,78 € have been taken 5 € provision and 2 € courtage for the exchange. So the total amount I got was 65,78 €. This is not my first international transaction and something like this never happend before. And are we two the only ones who used their bank accounts instead of paypal? Or why did this not happen to anybody else? Last edited by WWidow; 7th Jan 2016 at 12:24. Same here as far as i am concerned my bank kept a -5% from the total amount i got which was 62 euros or else 67 dollars plus -5% i got 56 euros .Also my country's tax is at max 23% so in any way there shouldn't be 56 euros but 67 euros if we assume that a total of -28% was kept from the bank and country laws together so something's not right here. 1/3 of the money is missing it's not a small amount in my opinion.I ll check again but in case the bank or country laws didn't took it what are we supposed to do?Can we get for start at least a copy of your receipt of payment to our accounts via e-mail or something to have proof for the banks or something like that? Indeed I too was cut short by 20$ (got 130$ instead of 150$ as i should have) with my bank charges being roughly 7.14$(60 sek) it ended up on 122,85$ total. I'm guessing this 20$ was the fee for sending the money from their German bank to a bank in bloody NEW YORK and then back to Sweden again... the money I get from ESL for the tournaments seem to go directly from Germany to my account and I get the full amount. That does indeed look a little odd HexMee, thanks for letting us know that something is up as well. Further investigations are to be had. I would imagine it'll be next week before we learn more, but we're working with ESL to find out what has happened. Are there any new information aleady? I'm terribly sorry about this delay. ESL is looking into this at the moment. I'll provide you with an update as and when I hear more from them. I hope to see some movement during the week. Progress is being made! The discussions with banks have occurred and it looks like they imposed an additional charge when the money was sent. ESL will be sending the outstanding funds on Friday (these being bank transfers, it will take a few business days for the funds to reach your accounts). Apologies once again for the delay, and thank you very much for highlighting the issue in the first place! It seems that I received the full 600$ from league 3.0 without fees so that's great! Cheers for the quick investigation. Sweet! Thanks for the confirmation! Sorry if you would prefer a 3.0 league prize update thread, but just wanted to let you know that i also received the full price from league 3.0 . My Nickname is Sharp Solid. I've a problem about it,too. I finished 66th at League Series/Ranked 2.0 Beta but I didnt recieve my money,yet. I sent my bank information before deadline after you sent me an email but so far I didnt recieve anything. I sent an email about it to ESLprizes(which email you contacted with me) but I didnt get any response,either. I want the money I deserved after my labours so I'm expecting your help. I received the 250USD from league 3.0 via Paypal,who withheld 10,05USD.Total received 239,95USD. So it applied 5,2% fees ...I think cause from USA to Italy. 1 Question,is this supposed to be like this? I mean,why someone got the full amount and I didn't? Even thought from USA to EU? Well i got the rest but once again it wasn't what it supposed to be.I got 12.94 euros instead of 30 but i ll leave it here.3 months is already big waste of time .Just 1 question, should i continue playing this game and play ranked and hopefully get full prize for once or should i quit it cause every time i ll have this issue?